The largest fully operational radio telescope on the planet – the Arecibo Observatory in Puerto Rico – will soon be under new management. A consortium led by the University of Central Florida will start formal transition activities to take on the management of the National Science Foundation’s Observatory. NSF is negotiating the operations and management award with UCF. With its partners, Universidad Metropolitana in San Juan and Yang Enterprises, Inc. in Oviedo, the team plans to expand the capabilities of the telescope, which has made significant contributions to science. The 18-acre reflector also was featured in the James Bond movie GoldenEye. The agreement is valued at $20.15 million, subject to the availability of funds, over five years and is scheduled to begin April 1. 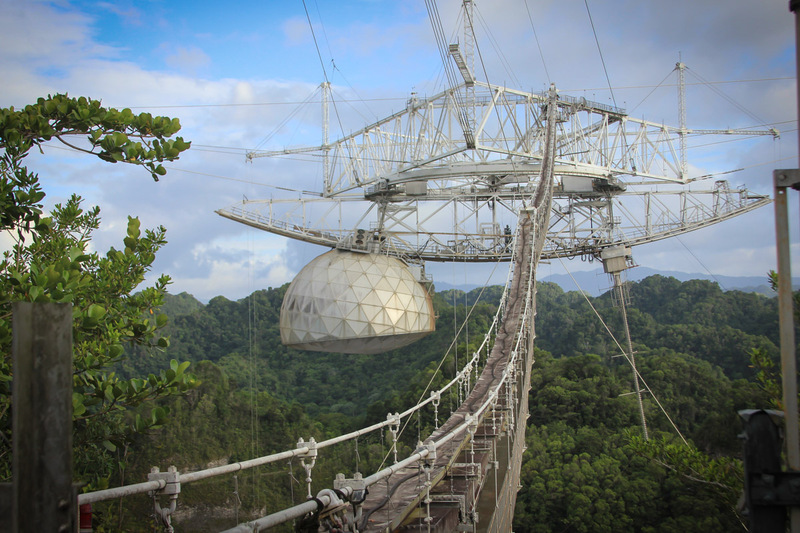 The new agreement means the Arecibo Observatory will continue to offer scientists from around the world an opportunity to pursue radio astronomy, atmospheric science and planetary radar research. The consortium, calling itself Arecibo Observatory Management Team, also ensures that the observatory will continue to track potentially dangerous near-Earth objects. This partnership is an opportunity to help create a pipeline for students to study space sciences both in Puerto Rico and Central Florida by providing hands-on opportunities at the observatory. The university’s role is focused on public outreach and engagement through formal and informal education. This partnership is an opportunity to help create a pipeline for students to study space sciences both in Puerto Rico and Central Florida by providing hands-on opportunities at the observatory. For Yang Enterprises, Inc., the partnership has special significance. Tyng-Lin (Tim) Yang, founder and executive vice president, earned his Ph.D. in civil engineering at UCF in 1990. He also serves as an adjunct professor in the Civil Engineering Department and on the Dean’s Advisory Board for the UCF College of Engineering & Computer Science. He and president and CEO, Li-Woan Yang, built the company to a multimillion-dollar enterprise. Yang Enterprises, Inc. provides architecture and engineering, operations and maintenance, and logistical services for mission-critical systems for multiple NASA centers, the Air Force and several Fortune 500 companies. The group will be responsible for facilities infrastructure, engineering, operations, maintenance, information technology and support services, as well as logistics and security services. Yang Enterprises, Inc. will introduce new technologies and cutting-edge tools to support Arecibo’s requirements and modernize operations. Built in the 1960s, the observatory continues to make significant contributions to understanding the universe. Scientists from around the world have used the telescope. Physicists Russell Hulse and Joseph Taylor used the observatory to monitor a binary pulsar, providing a strict test of Einstein’s theory of general relativity and the first evidence for the existence of gravitational waves. Physicists Russell Hulse and Joseph Taylor used the observatory to monitor a binary pulsar, providing a strict test of Einstein’s theory of general relativity and the first evidence for the existence of gravitational waves. That earned the men a Nobel Prize in 1993. Today, pulsars are being used to search directly for gravitational waves through incredibly accurate timing with the Arecibo telescope. In 2017, the Arecibo Observatory discovered two strange pulsars that undergo a “cosmic vanishing act” – sometimes they are “on,” and then for very long periods of time they are “off.” This has upended the widely held view that all pulsars are the orderly ticking clocks of the universe. 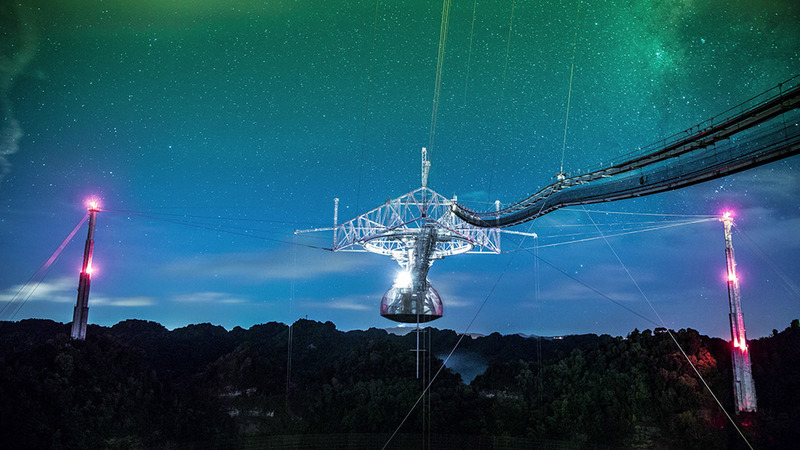 In 2016, the Arecibo Observatory discovered the first repeating fast radio bursts, which are millisecond radio pulses that appear to be extragalactic. Arecibo’s research success is no accident. The location was picked because it has a lot of karst terrain with limestones and sinkholes. When exploring the island for a good location, scientists found a sinkhole with the near-perfect shape needed for the observatory and its giant dish. Additionally, its location allowed observations of a little-studied part of the Earth’s ionosphere near the equator. 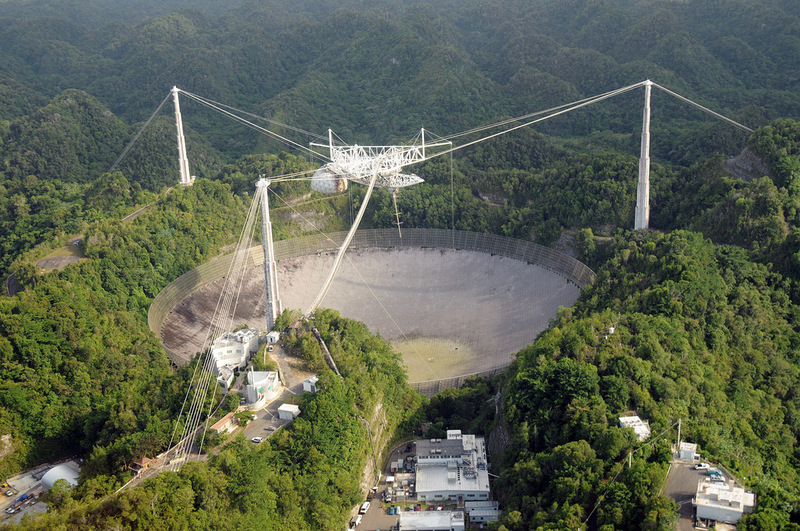 The NSF has been funding part of Arecibo Observatory’s operations since the 1970s. Starting in 2010, NSF received input on the priorities for its scientific operations through the National Academies 6th Decadal Survey, the NSF Division of Astronomical Sciences Portfolio Review Committee Report and the NSF Geospace Sciences Portfolio Review Committee Report. Based on that input, the NSF examined the options for continuing Arecibo Observatory operations. After extensive environmental-impact analysis and input from the public and the scientific community, the NSF decided to continue operations and put out a request for proposals to manage and operate the observatory. The move allows important research to continue while accommodating the agency’s budgetary constraints and its core mission to support cutting-edge science and education. “The kind of science we can conduct with this observatory is important, and we didn’t want to see it go dark,” Klonoff said. setting up tourism programs around the facility that will generate revenue and help the local Puerto Rican economy.